Hi Thank you for you reply, I think hes simply beautiful. 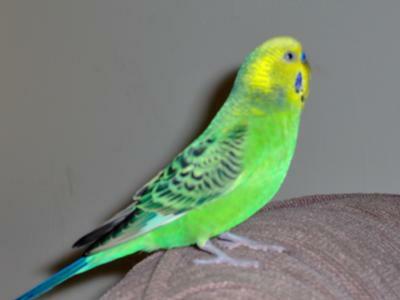 i have kept budgies before, in fact I had an avairy and bred some budgies but Buddy is a type that I have not seen before. I am going to get a single budgie to give lots of attention to. I think they are beautiful birds. I will be looking for one similar to your Buddy, if I can find one! I live in Brenzett, in the United Kingdon. Wow what a beautiful budgie,what type is he please? he is simply charming. Hes Gorgeous! !I love how friendly these guys are.I have one named Eagle Eye that I bred.She HAS to be on my head in the birdroom,lol! !Watch that under the cover stuff during mating condition,it can make them too hyped up to be "nesting"with you,lol! !